Comments: “Queen vs. Empress” Written by Bill Hanstock, illustrated by Hyeonjin Kim, colored by Wesllei Manoel and lettered by Jim Campbell. Its Charlotte and Asuka face each other in the squared circle. These two beautiful women go all out in the ring. They are top athletes which the art here does bring out. These two women embody what the WWE is all about. “The Destruction of Brothers” Story by Andrew Stott and Andy Belanger, written by Andrew Stott, illustrated by Andy Bellanger, colored by Lee Loughridge and lettered by Serge Lapointe. 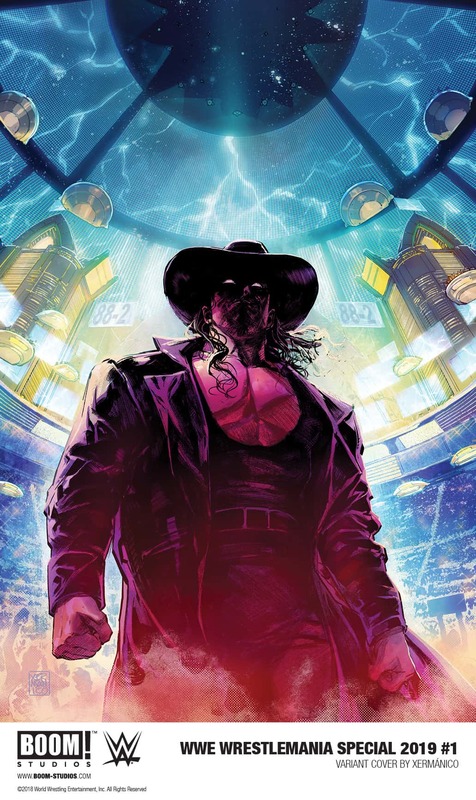 The art brings across the disturbing upbringing of the Undertaker and Kane. These two in the ring continued the relationship they had as children. The art though is lack luster. “King Without a Crown” Written by Lan Pitts, illustrated by Serg Acuna, colored by Doug Garbark and lettered by Jim Campbell. Shinsuke Nakamura gets a pep talk from Asuka. He just needed a little reminder of who he is. Who he is is someone special. “I’m Sorry, I Love You.” Story by Ryan Ferrier, illustrated by Kendall Goode and lettered by Jim Campbell. Here we get Shawn Michaels vs Ric Flair in the ring. Shawn has so much respect for Ric. They are both drawn to show their ages. This comic is for those who love the WWE and wrestling. The wrestlers are presented just as they are in real life. If your a fan of WWE you will be a fan of this comic as well. The WWE is excitement.